The year was 2007. It was the height of the Iraq war and the United States was losing soldiers every week. In the middle of it all was a chaplain named Darren Turner. 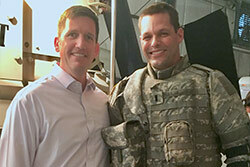 Darren felt a call from God to minister to soldiers. What he didn’t realize is what a toll it was having on him and his family. When he got home from Iraq his marriage started to fall apart. His wife Heather kicked him out of the house, forcing him to get help. He left the military and went to work at Home Depot. Today, he’s back in the military and he and Heather are telling other couples that they can make it through dark times too. Their incredible story is in the movie “Indivisible” which comes out today. Listen as Jerry and Blanca interview the real life Darren and Heather Turner about their journey. You can learn more about the movie and see the trailer at www.indivisiblemovie.com.